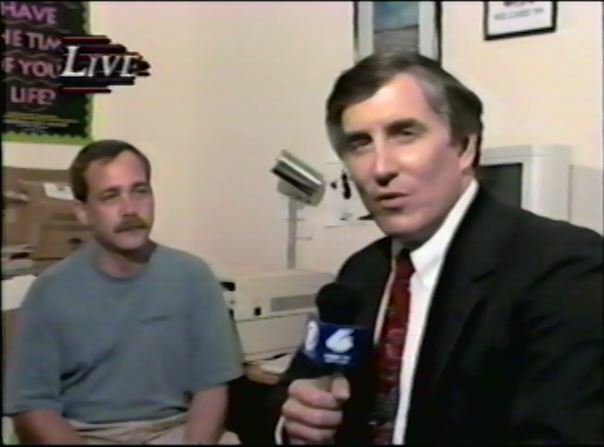 Robb Dussliere and Ken Gullette broadcasting live on WHBF-TV in July, 1995. Sometimes things slow down in summer, but in 1995, Robb and I were trying to come up with weekly feature stories about his life with AIDS. Nothing much was happening in the early part of July, so we had a brainstorm. Instead of the usual feature, Robb would take phone calls from viewers and we would go live during the 10 O’Clock newscast. We would broadcast from the office of the AIDS Project Quad Cities (now called The Project). I forgot that I still had this live report on tape until a few days ago. Don Sharp, the veteran WHBF-TV broadcaster, was the co-anchor who introduced us on the air that night. Being the news director, I went on the air rarely, so it was strange to do a live remote, but it was fun. Here is the video, with the new number of The Project superimposed over the old AIDS Project number. 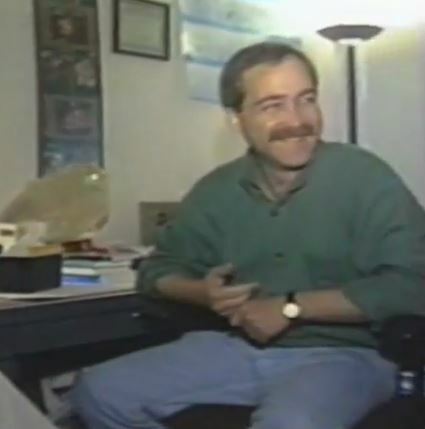 Robb’s Life began as a weekly news series during the last week or two of April, 1995. The first two or three stories were shot over two or three days, intended to introduce Robb to the community. At that time, I did a weekly public affairs program on WHBF-TV called “4 Front.” On the Sunday before Robb’s Life debuted on the news, I asked Beth Wehrman and Robb to appear on the program. Looking at the interview now, it is obvious that I felt the magnitude of the project ahead, and I was still stunned by the knowledge that Robb’s death would be part of the series. I also did not know Robb very well at all when we did this interview. If it had been later in the series, I would have lightened up at times and drawn out his sense of humor a bit more. As you can tell from this video, he was more prepared to laugh than I was. Beth, who was a very warm-hearted person, was already feeling the weight of the AIDS patients that had been lost in the Quad Cities. Tragically, Beth passed away from cancer in 2008. Enjoy this interview from Sunday, April 23, 1995. On the day I met Robb Dussliere, on a chilly, drizzly morning in the first week of April, 1995, I was a 42-year-old recovering Southern boy who had grown up with all the prejudices taught to me in the Fifties and Sixties, and the “morals” that I heard shouted from the pulpit every Sunday morning. I did not like gay people very much. As teens, my buddies and I swore that if a “queer” ever tried anything on us, we would beat the crap out of him, by God. We made fun of queers, prancing around with limp wrists, lisping in loud, exaggerated voices. We were not mean to any real people. We didn’t know any gay kids to bully or humiliate. It was just the kind of tough talk that was common among real Southern boys. Robb Dussliere was the first gay man I ever really knew. Oh sure, I suspected some guys over the years, but they were so deep in the closet you couldn’t see them hiding. Now, all these years later, Beth Wehrman, the executive director of what was then called the AIDS Project Quad Cities, asked me to come over and talk about a potential news story. I was news director at WHBF-TV in Rock Island, a stressful job leading a small news department against two stronger stations in a competitive market. Every moment I took out of my day for meetings caused a corresponding increase in stress, but for some reason, I agreed to the meeting. The office was located in downtown Davenport, in a former motel just a couple of miles from the station, a short drive across the Mississippi River via the Centennial Bridge. The door opened and Robb said hello, a handsome young man with a thick brown mustache. My first impressions were positive — he was friendly and cordial but not flashing the smile I would quickly find so engaging. I’m sure he was a little nervous. Nothing in his mannerisms indicated he was gay, neither his speech, the way he walked, or the way he dressed. I liked him immediately. He was a regular guy. For an hour, he and Beth explained their idea. They wanted to duplicate locally a series of reports broadcast in Canada a few years before by Dr. Peter Jepson-Young, a physician who had contracted AIDS and spoke directly to a camera over a period of two years. As his disease progressed over 111 episodes of the Dr. Peter Diaries, the audience watched Dr. Peter’s condition deteriorate, and by the time he died, in November, 1992, his reports drew tremendous attention and raised a lot of awareness about HIV and AIDS. On a small TV, Beth and Robb played a VHS tape of The Broadcast Tapes of Dr. Peter, fast-forwarding to selected episodes. I watched as Dr. Peter grew weaker, ravaged by the disease. It was quite moving, and the real gravity of the idea they were offering began to sink in. I sat and thought for a minute when they turned off the TV. Robb was leaning forward in his chair. Beth watched me, her kind face drooping with a look of melancholy that always seemed to be so close by. “Do you have a patient in mind?” I asked. My blood ran cold, literally sending a chill through my body. This healthy-looking young man is telling me he is dying? And more importantly, he has AIDS? I looked down at my hand. I had shaken hands with him. I needed to wash it as soon as I got the hell out of there. Wait a second. He’s gay? He doesn’t seem to be gay. We talked about when we would begin and what we wanted to cover, such as educating viewers on avoiding HIV, raising awareness for the isolation and poverty faced by people living with the disease, and putting a real human face on the issues surrounding AIDS. First up, I would need to shoot some stories that introduced Robb to the community. The story had a scope far beyond the normal two to five-part “sweeps” series that we normally did during ratings periods. But May sweeps were coming up, so we had to move quickly. I promised to call back soon and set up initial interviews and video. I avoided shaking Robb’s hand when I left, but something else happened that was very unusual. By the time I got to my car the rain was coming down a little harder. I sat for a moment, listening to it fall on the windshield and roof. For some reason, the journey I was embarking on was there, in front of my eyes. I had agreed to record this man’s death. I started crying, grateful that nobody was walking by to see a grown man crying in his car in the rain. It would not the the last time I would shed tears over Robb. Rain fell as I slowly drove back to the station, trying to get my act together, my mind shifted back into professional mode, wondering which reporter I would assign to this story. When I got to the station, I broke a land speed record making my way to the men’s room, lathering the soap on my hands extra thick, hoping that I had not been hit by the virus. The DeLaCerda House provides support and housing to HIV/AIDS patients who have no place to turn. Robb helped launch the facility during the last year of his life. Please consider helping, even with just a few dollars, by clicking on the Donate button on the right side of the DeLaCerda House page. Your donation goes directly to DeLaCerda House.